Even with the heat taking charge this summer, you shouldn’t have to give up the boost of caffeine during your morning routine. Put those cappuccino cravings on the back burner and move frappe freedom up to the top of the list – it’s time to get your iced coffee on! Luckily, we have the perfect products for any morning, no matter how sweltering it is outside. Beat the heat and lack of sleep all at once! If you like your caffeine to hit like a train, cold brew is the way to go. This easy-to-use and money-saving option allows you to make your very own cold brew overnight. The maker holds about four servings of coffee, is airtight, shatterproof, BPA-free, and dishwasher safe. The pitcher body can withstand both freezing and boiling liquids, so when the temperature outside goes back down you can adjust the temperature of your coffee back to its comfortable, steaming normal. For your on-the-go coffee needs, this cup makes the drive to work cool and simple. The colorful mason-jar with a twist is dishwasher safe and the glass won’t add any unwanted taste to your coffee. Whether you’re looking for a beach day, a gym buddy, or a desk-mate, this cup can accommodate all your iced-coffee or cool drink desires. Plus, with the splash-free cork lid, you can bring it anywhere without fearing for your car seats. Summer is the perfect time for some morning experimentation. With your new cold brew maker, try some different coffee beans! 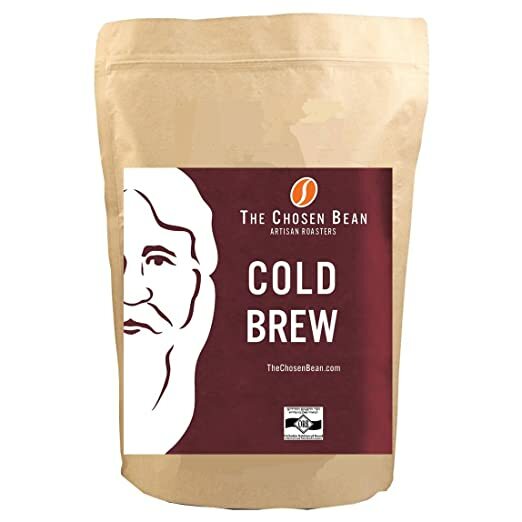 This cold brew has been ranked among the top five in the USA and is sourced directly from single-origin farms with 100 percent Arabica coffee beans. The beans are hand-roasted in small batches to bring out the true, rich flavor. This company works closely with farmers, importers, and customers to make sure that their coffee is best for everybody involved. So, give the Chosen Bean a try and drink guilt-free by choosing not to indulge corporate coffee roasters. Looking for a Starbucks-worthy drink without the bank account strain? Try out some fun flavors in your very own kitchen. Torani offers an array of flavors for any cold (or hot) drink from cold brew to Frappuccino. Flavors like caramel, toasted marshmallow, and vanilla bean add just enough extra to give you a leg-up as a cold-coffee connoisseur. Plus, the 25 oz bottle allows you to make plenty of mistakes when creating your morning masterpiece. Finally, in your quest for the perfect cold-coffee, it’s time for a key ingredient: ice. Why not make it cute? This ice cube tray from Lekue will allow you to shake up your ice shapes. For a sweet boost, even add a little Torani syrup or chocolate to your iced coffee. If you don’t want the flavor diluted, freeze your cold brew and keep the flavor rich and consistent. For more coffee tips and tricks, check out the fabulous blogger and my personal coffee guru Aubrey Johansen and her blog post on how she does cold-brew in the mornings. NYMM is a participant in the Amazon Services LLC Associates Program, an affiliate advertising program designed to provide a means for sites to earn advertising fees by advertising and linking to Amazon.com.